Things have been pretty busy here in Hickey-land. My family sold our old craftsman home in NE Portland and bought another old home in SE Portland. 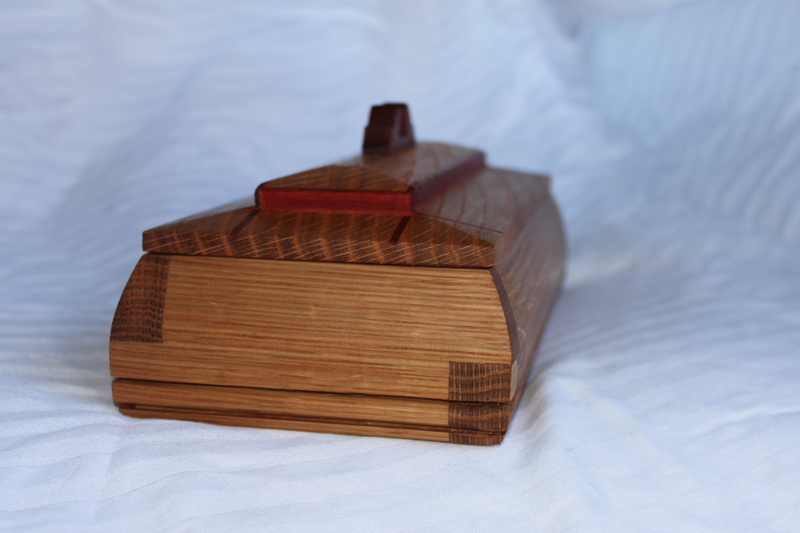 I’ve finished up the Mastery program at NW Fine Woodworking Studio and life with my two girls has been continuing at what sometimes seems a break-neck pace. As such, this post is going to be a bit of a data-dump. This new space has the advantage of a large 4-car garage that I have been converting to my new shop. One advantage (of many compared to my old basement shop) of the new space is the south-facing glass roll-up door. The plentiful natural light ought to improve my finish surfaces. Whoo-hoo! Since this photo, I’ve completed the insulation on walls and ceiling with venting for the roof, installed new electrical outlets (5-220V!!!) , built lumber storage and a “clean-room”, and completely drywalled all the walls. It’s starting to shape up into decent space! One thing I’d still like to do is put in a plywood floor. The bare concrete threatens to chip my tool blades every time I’m in there, plus its cold and uncomfortable. The new ceiling insulation. Note the attic space; future lumber storage area! I then rebuilt the entire area with new tile walls and shower, a tile bathroom floor and white oak hardwood throughout the entire upstairs area. I learned a whole lot; including the fact that the biggest bang for the buck you can do to a house like this is replace the trim around the windows and doors. It looks fantastic! Not really woodworking, but it’s been keeping me busy and I feel great saving a ton of money over having it done professionally. 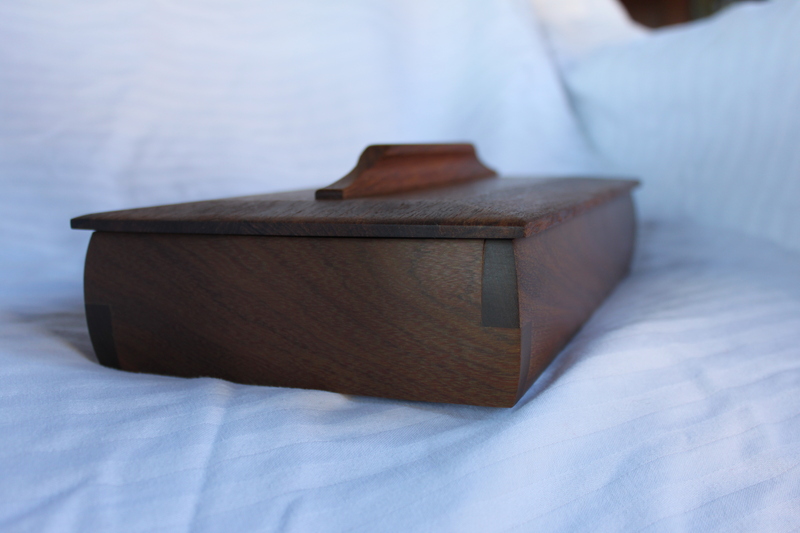 My attention to details learned in part from woodworking has served me well during the remodeling. And a shot of the hallway leading to the master bedroom; new oak floor in-progress. Note the new Kapex compound sliding bevel miter saw. It’s awesome! 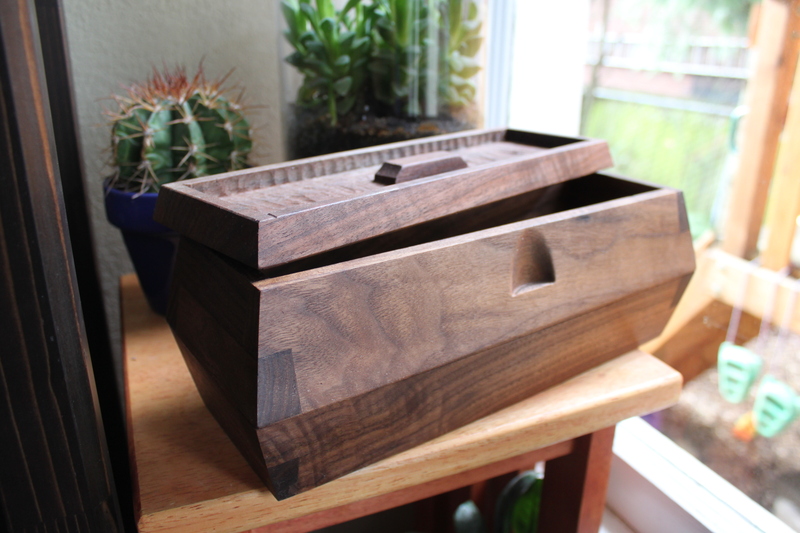 I also finished the mastery program at the NW woodworking studio this past year. If anyone is considering the studio for woodworking education I encourage them to give me a call. There is a lot I’d like to share about what to expect from Gary Rogowski. Here are a few photos of some of the work I did while there. Outside of the mastery program, I completed a few commissions and other small projects this year. But there is still plenty I need to do. Like I need another hobby, right? 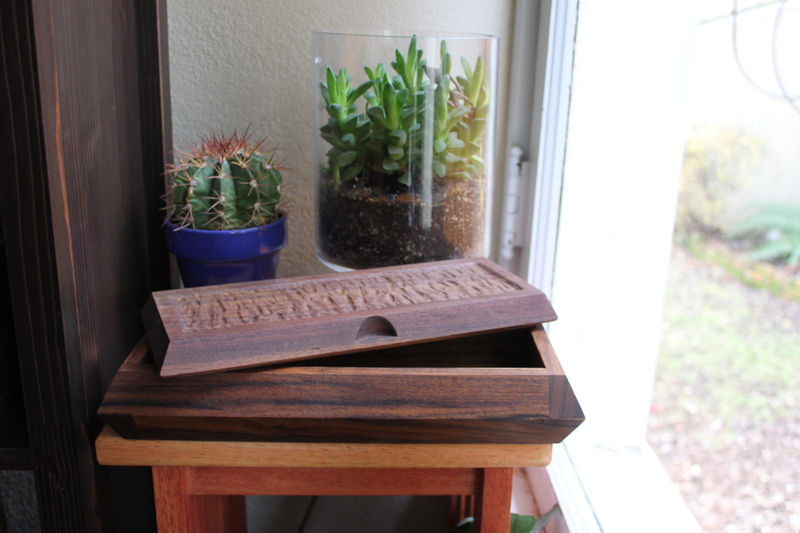 This is what happens when you play with milk paint and a set of carving gouges. Carved basswood cabinet/bookshelf in middle earth style. 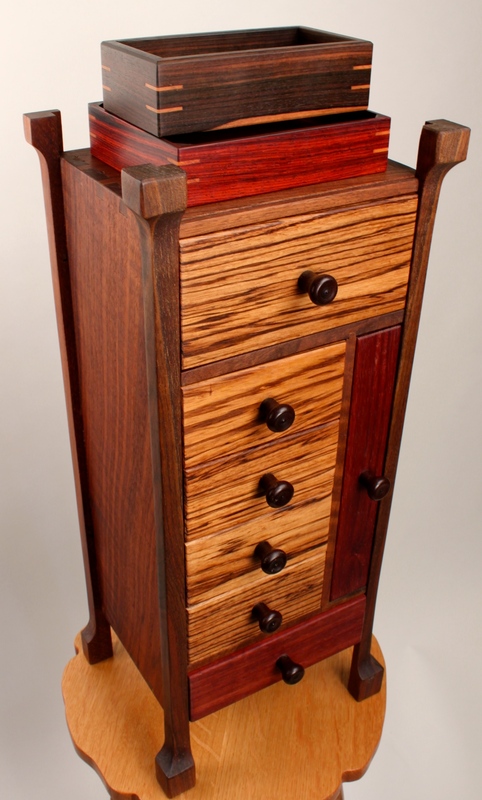 Mahogany back and base. Slanting the tongue and groove back pieces was a lot of fun. 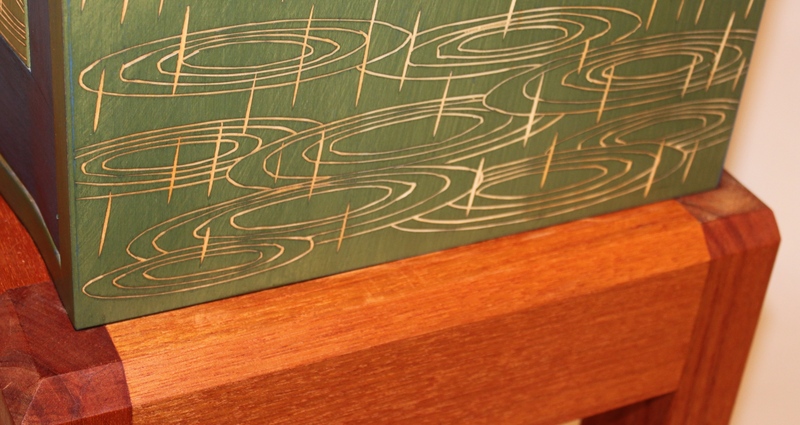 The interior of the doors panels are lined with Japanese rice paper. I built this to match a walnut Prairie couch and loveseat that I had already built for some valued clients. 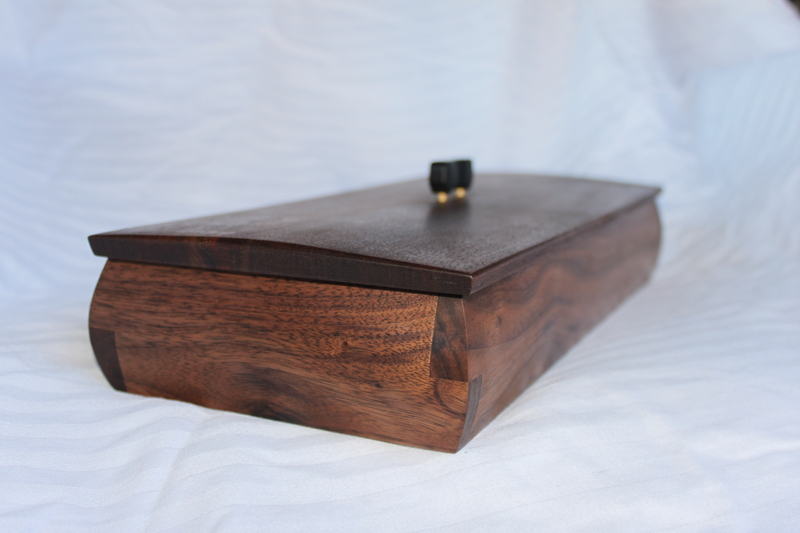 All solid black walnut with a purple-heart bottom. 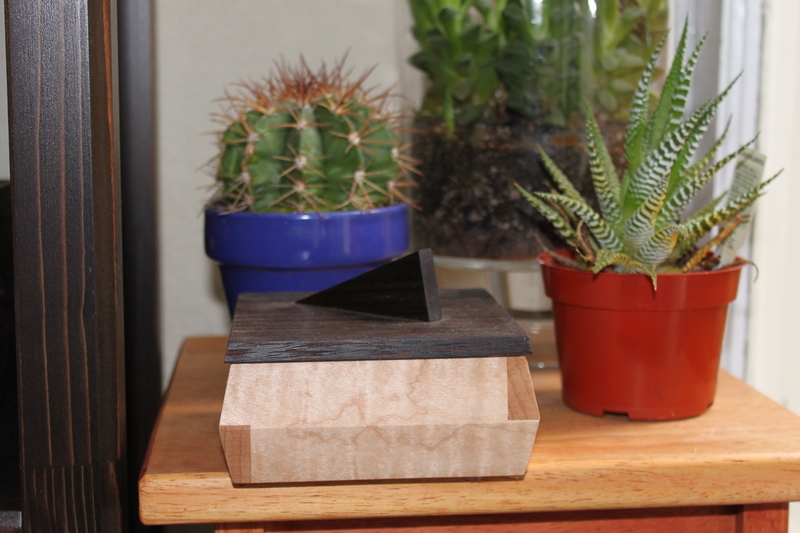 I feel like I have finally nailed the lapped and half-lapped miter. 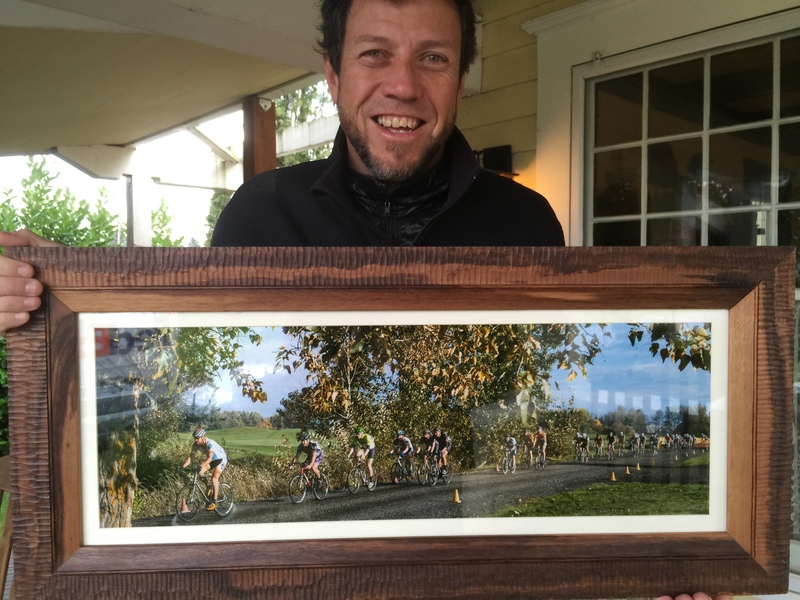 I finished this hand-carved solid walnut frame for an image taken by Lasala images for cross fanatic Mike Hall. 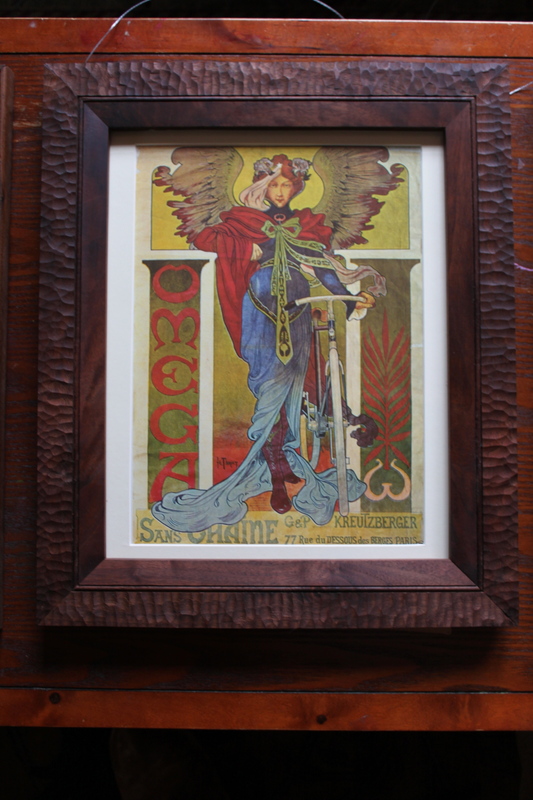 I love combining my passion for fine woodworking and cycling. 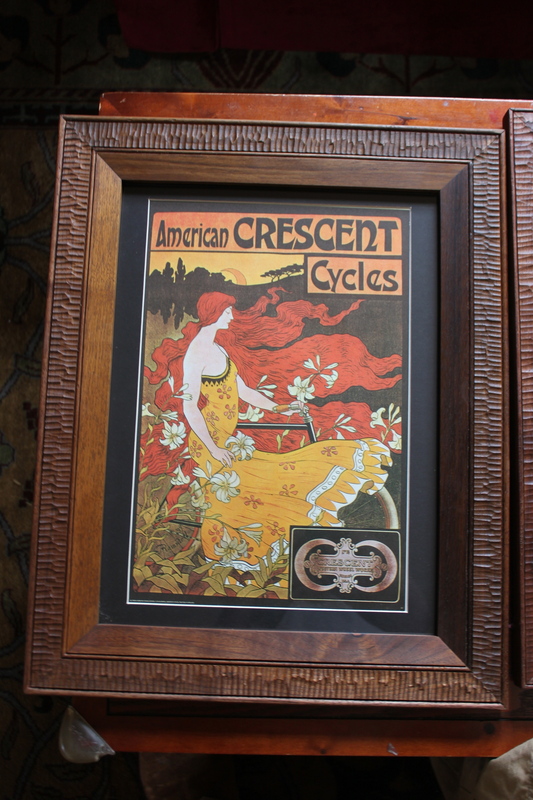 I can make these frames and professionally mount your image for less than most any frame shop in town. 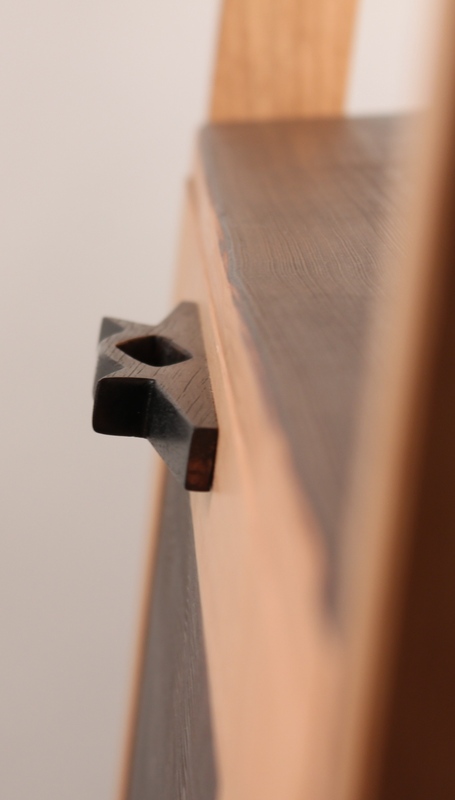 The joinery on the frames are half-lap miters, which are much stronger then the typical stapled plain miter joint used in the framing industry. Thanks Mike for your business! Version two of the St John’s coat rack is now complete and ready for the Lumber to Legacy program auction in Albany Oregon (http://cityofalbany.net/lumbertolegacy). The lumber was salvaged from a construction project in Albany that removed seven very large native Oregon White Oaks. The trees were donated to the city and milled by a local sawyer named Mark Azevedo. The lumber was air then kiln dried and distributed to local artisans as well as a group of high school kids to turn into projects to be sold at auction on November 9 of this year. 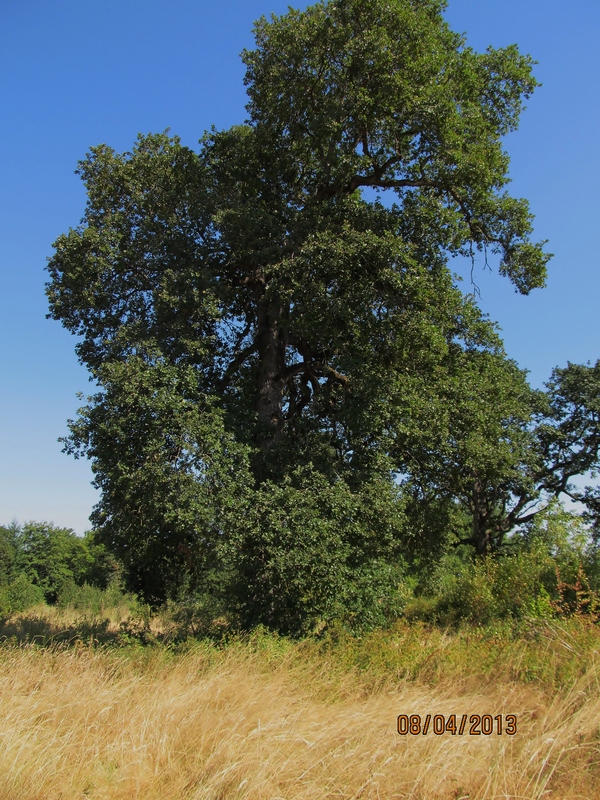 The proceeds will be used to purchase and protect additional Oregon white oak habitat; a task that is much needed as there is very little of this native habitat left in the state. Oregon is an interesting place to practice this craft. Though not wholly rich in proper furniture-woods like the forests of my youth, there is a newness of culture and an independent spirit here that is much to my liking. Teaming with local sawyers like Mark Azevedo has allowed me to bring a sense of place to my work with the use of native woods. There ARE very good species for furniture here in Oregon, they just take a little more work to uncover. I feel that a northwest style has yet to be defined and feel privileged to take part in the local studio furniture renaissance. 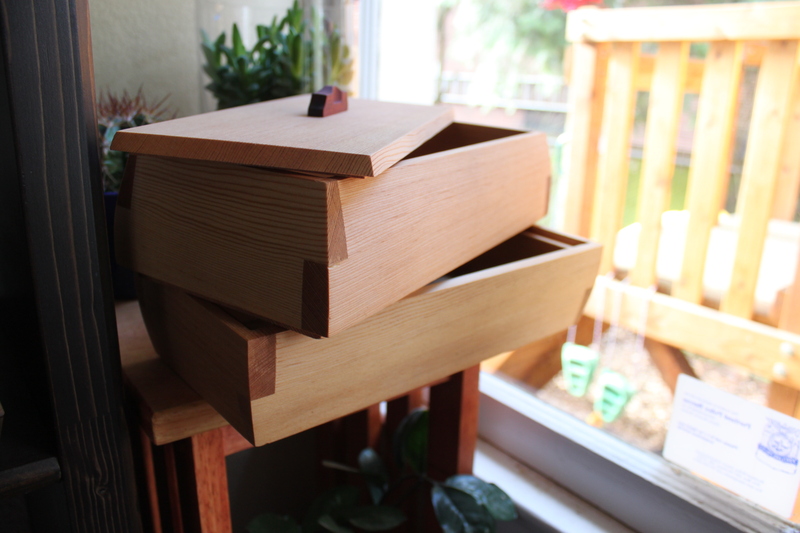 My piece for the Lumber to Legacy project began with a need for more storage space for our growing family. As the father of two young girls, we had a coat and shoe problem. 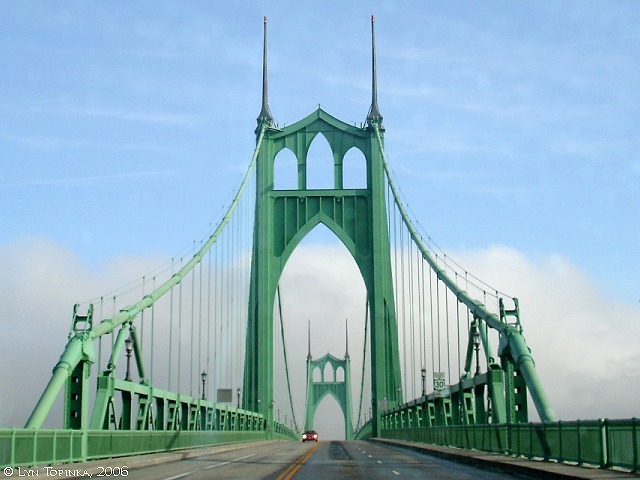 As I pondered a solution, I looked to a local Oregon landmark; the St. Johns Bridge. I’ve always admired its flying buttresses and gothic arches. I was an engineer in another life and thought “what better representation of the engineers craft than a bridge”? The St. Johns Valet features an abundance of coat hooks, both front and back. 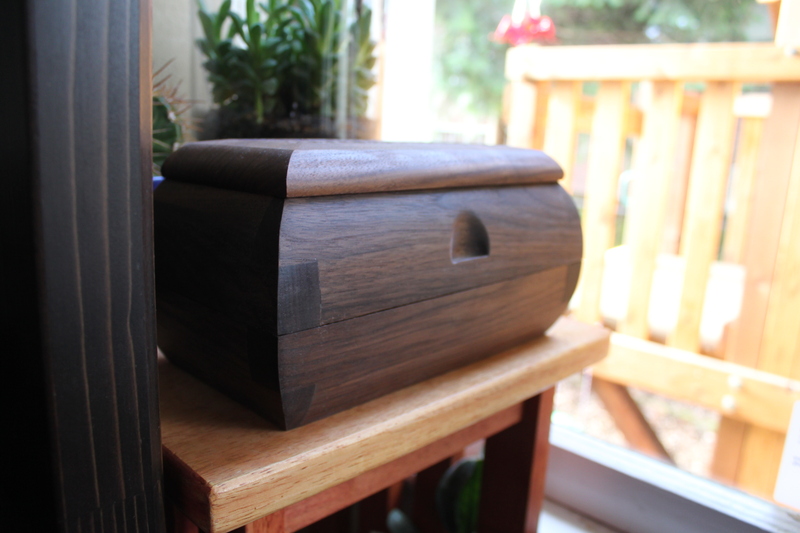 I used a Japanese finishing technique on the shoe cabinet called shou-sugi-ban, in which the sides of the case are charred with a propane torch, then scrubbed clean of charcoal prior to oiling and waxing. It leaves a textured and blackened surface that perfectly represents the actual bridges asphalt deck. 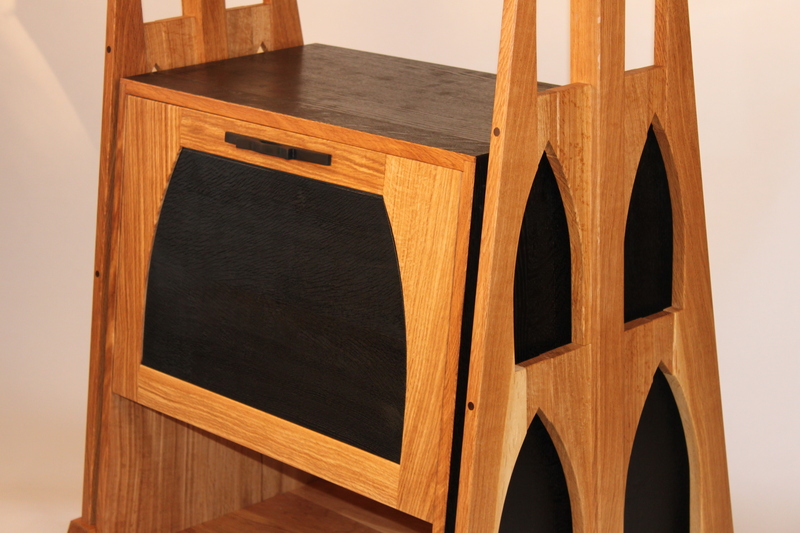 The oak procured from the Hackleman grove had a few interior checks which I left and filled with black tinted epoxy. I did this on purpose rather than scrap the wood and start over. The checks are representative of the poor state of the Nation’s bridges and other infrastructure- a fact that the former engineer in me would be remiss to neglect to represent. 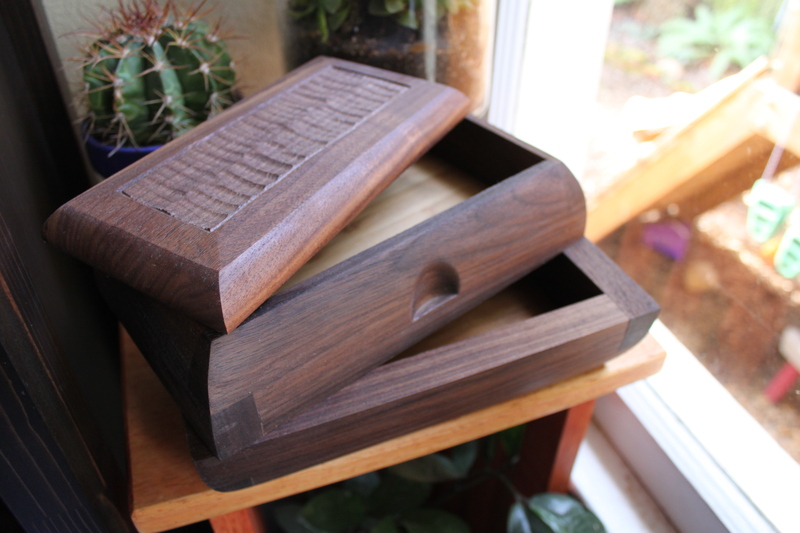 I topped the shoe cabinet with a hand-carved walnut pull, meant to represent the automobile age in it’s angular appearance. 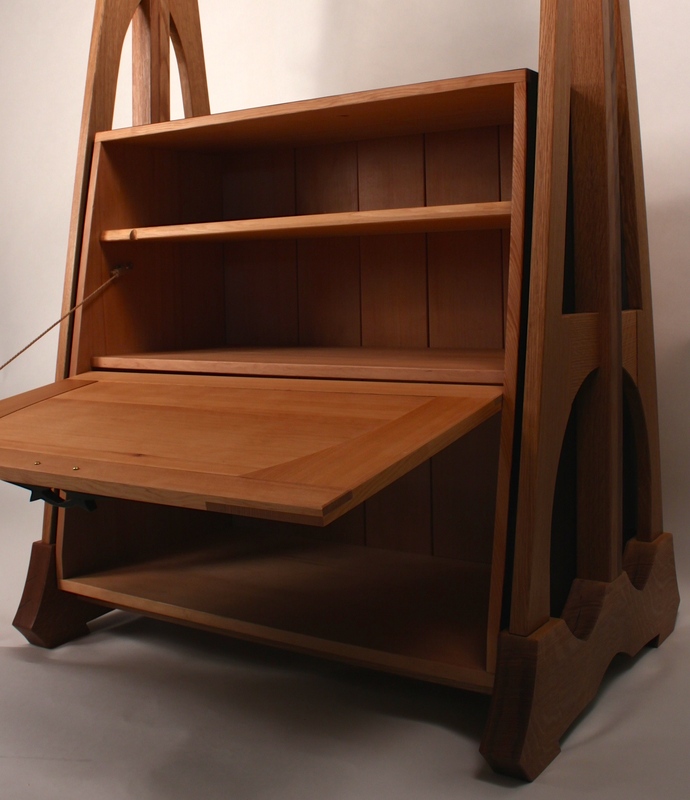 The front of the piece features a fall-front door which swings down on spring-loaded pin hinges I devised and reveals two shelves of shoe storage space. Larger shoes fit in the bottom shelf. 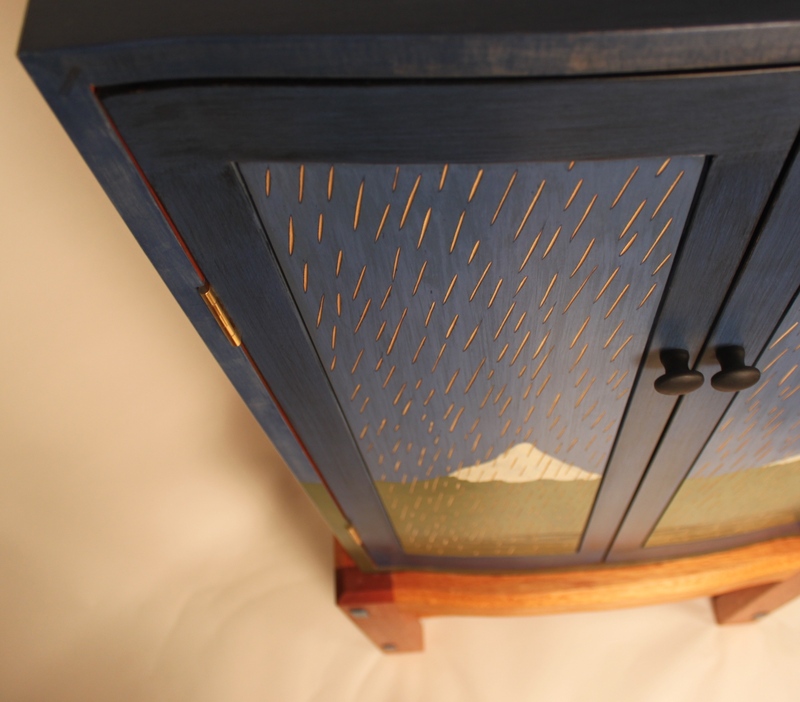 The back is designed to hold things like umbrellas, walking sticks and tennis rackets. I am very pleased with how this piece turned out and am hopeful that I am afforded the opportunity to work with the City of Albany and it’s Lumber to Legacy Project yet again. If you are interested in bidding on this or any of the other projects at the auction, please contact me as I have several tickets available for the auction and dinner. The St. Johns bridge here in Portland has always been among my favorite US bridges. Designed by engineer and poet David B. Steinman, the bridge was the longest suspension bridge in existence at the time of its construction. Mr. Steinman was an interesting man; he helped to codify what it means be trained as an engineer. His poetry often makes reference to his passion for the craft. 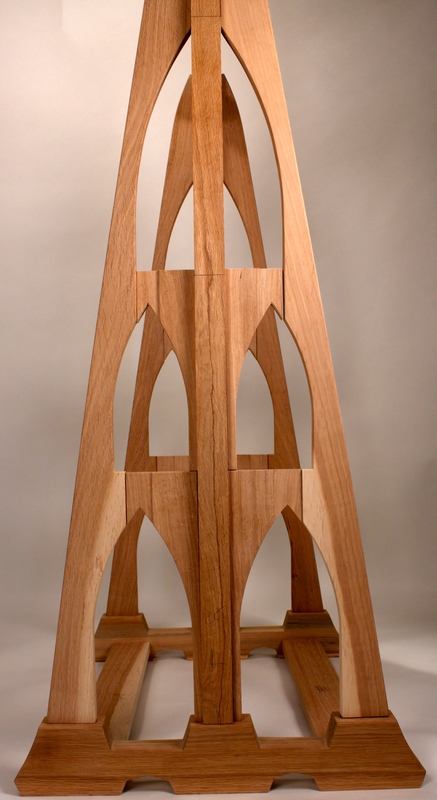 I’ve always admired the St. Johns’ flying buttresses and tall spires and have wanted to incorporate some of it’s features into one of my pieces. After all, I was an engineer in another life; what better representation of the engineers craft? 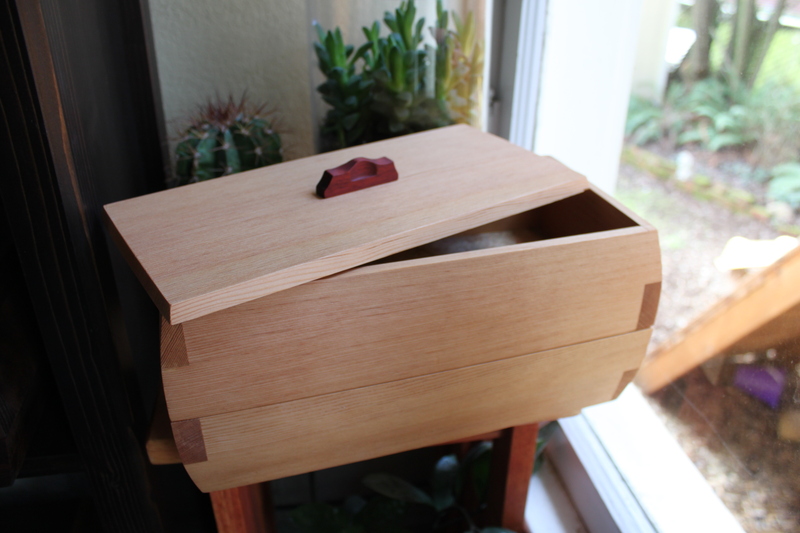 During our first year at the NW Woodworking Studio, we were tasked with building a standing cabinet. I finally had my chance to play with the iconic Portland landmark! As the father of two young girls, I recognize that we have a coat and shoe problem. Unfortunately, I am condemned me to always be the tidiest person in any gathering, and since having kids I’ve been cursed with the task of general pick-up any and every time I enter a new room in my house. Where are we going to put all these things? 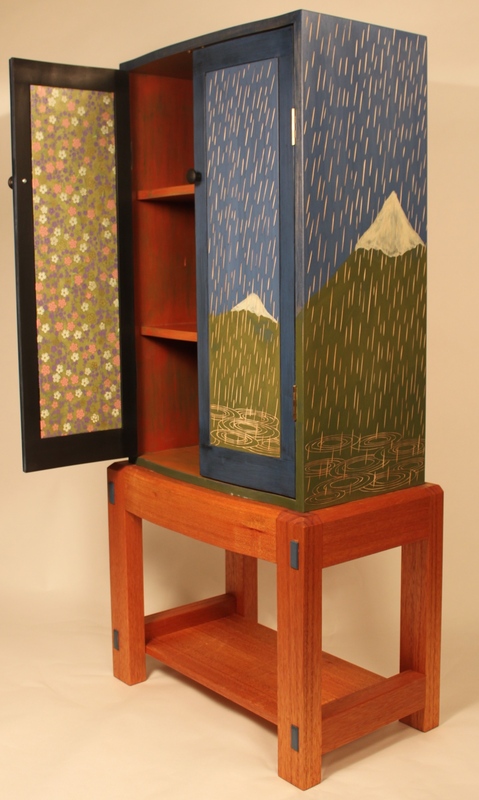 Our craftsman bungalow hardly has any closet space; we need a standing cabinet that holds shoes and coats! And the St. Johns coat rack was born. 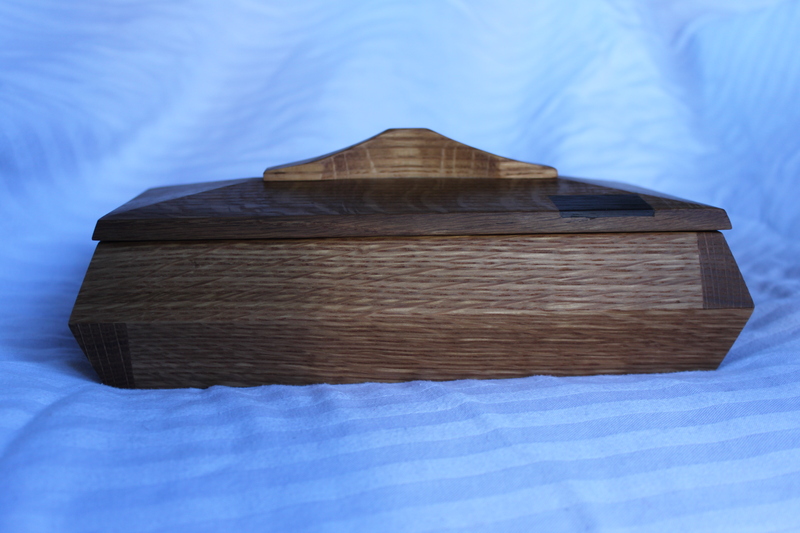 Version one is for our house and is made of white oak and has a hemlock carcase. 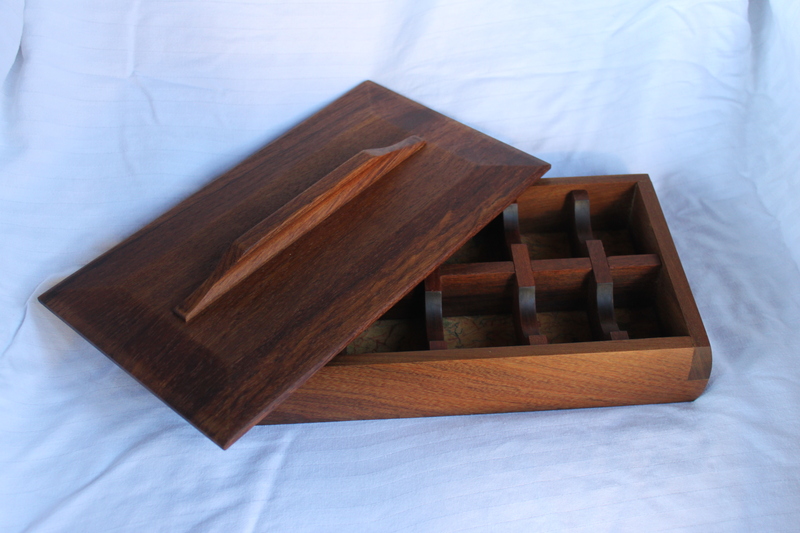 The top features enough room for 10 or more coat hooks (four in front, four in back and two or more on the side). 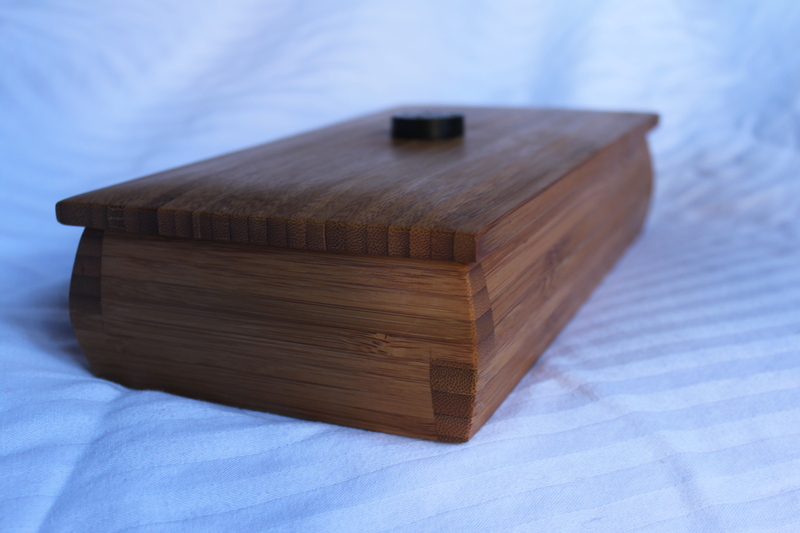 I used a Japanese finishing technique on it called shou-sugi-ban, in which the sides of the case were charred with a propane torch, then scrubbed clean of charcoal prior to oiling and waxing. It leaves a textured surface on hemlock indicative of the woods early and late growth. 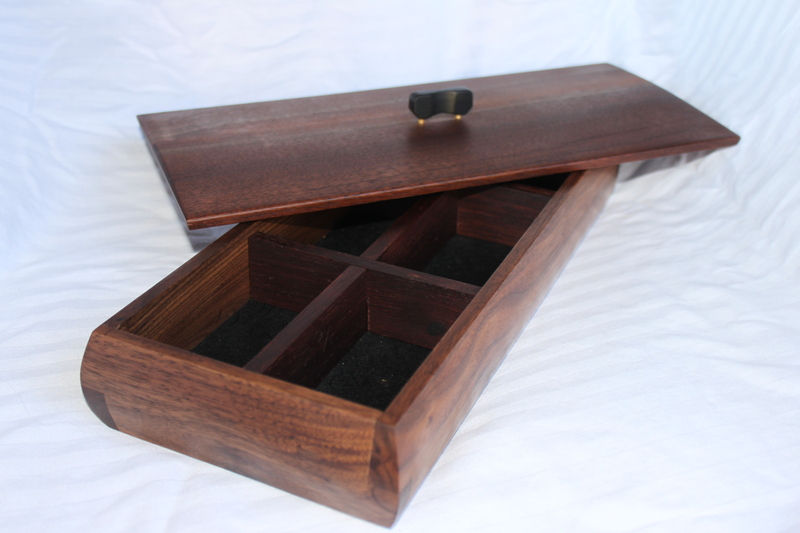 I wanted a cabinet carcase that represented the asphalt on the bridge deck and I believe the shou-sugi-ban technique was a real success at this. 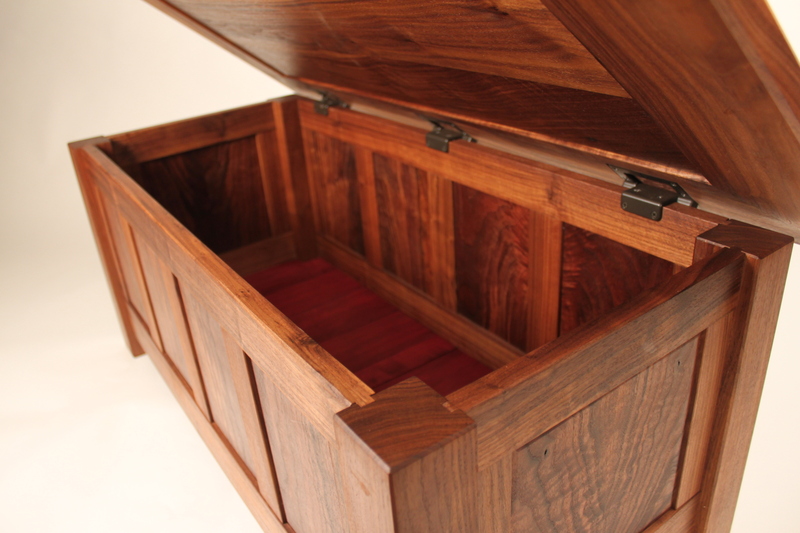 The oak had a few interior checks which I left and filled with black colored epoxy. I’d be remiss in my allegiance to my former profession if I did not point out that the checks are representative of the poor state of the Nation’s bridges and other infrastructure. 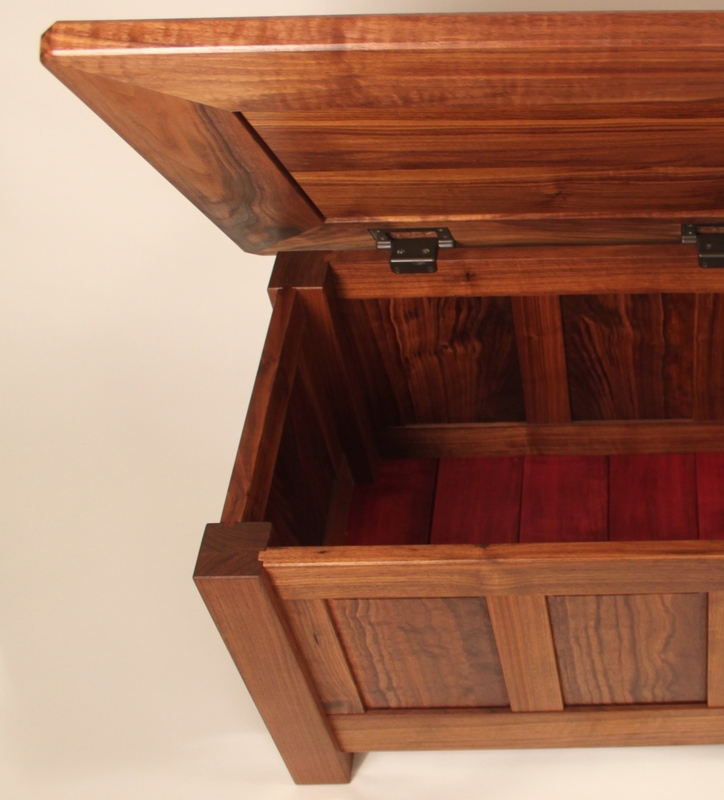 The final design is large; large enough to get laughed at at the NW Woodworking studio, but sufficient non-the-less to fit nicely into our vaulty craftsman home. 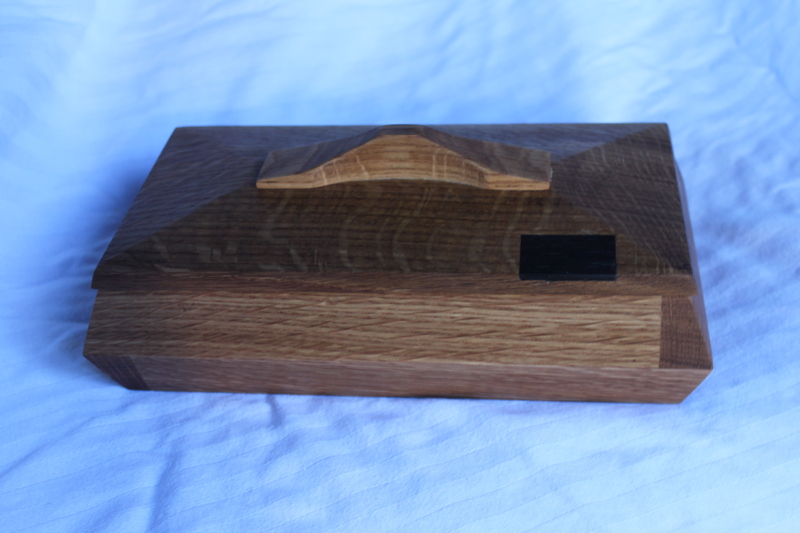 I topped it with a hand-carved pull, meant to represent the automobile age in it’s angular appearance. 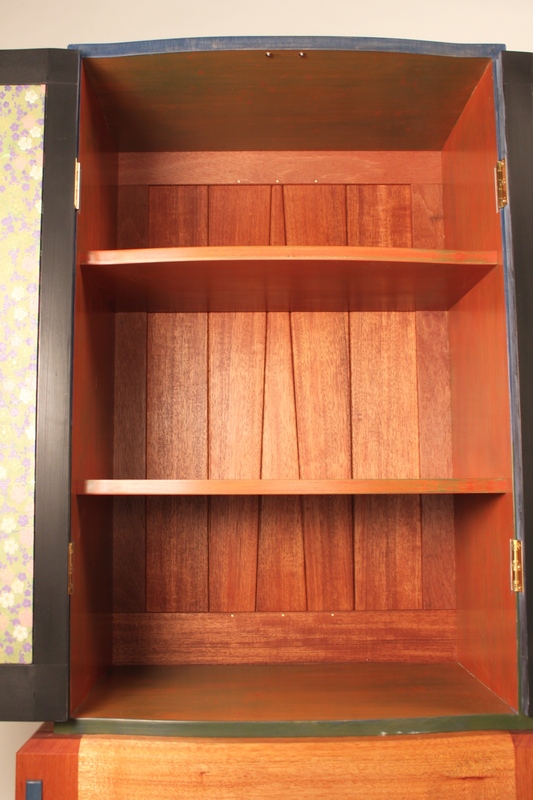 The front features a fall-front door which swings down on spring-loaded pin hinges I devised and reveals two shelves of shoe storage space. Boots fit in the bottom. 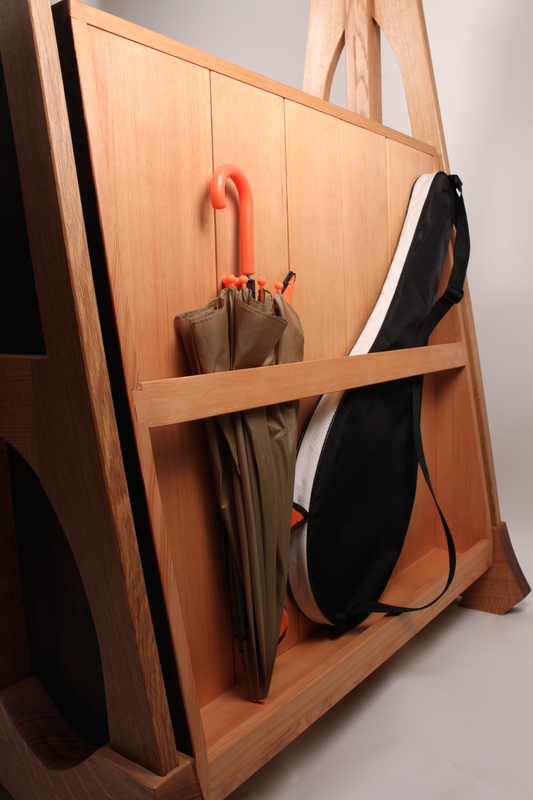 The back is designed to hold things like umbrellas, walking sticks and tennis rackets. 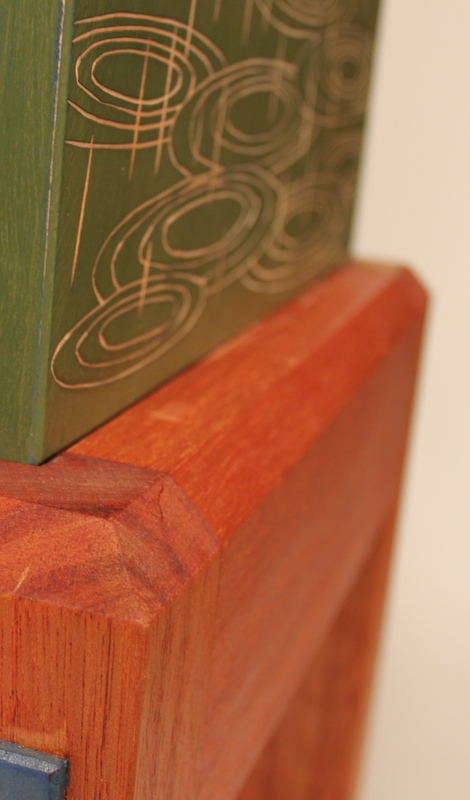 Version two is currently under construction and will be sold via auction to benefit the “Lumber to Legacy” program which buys Oregon white oak habitat to set aside for future generations. The auction is set for Nov 9. 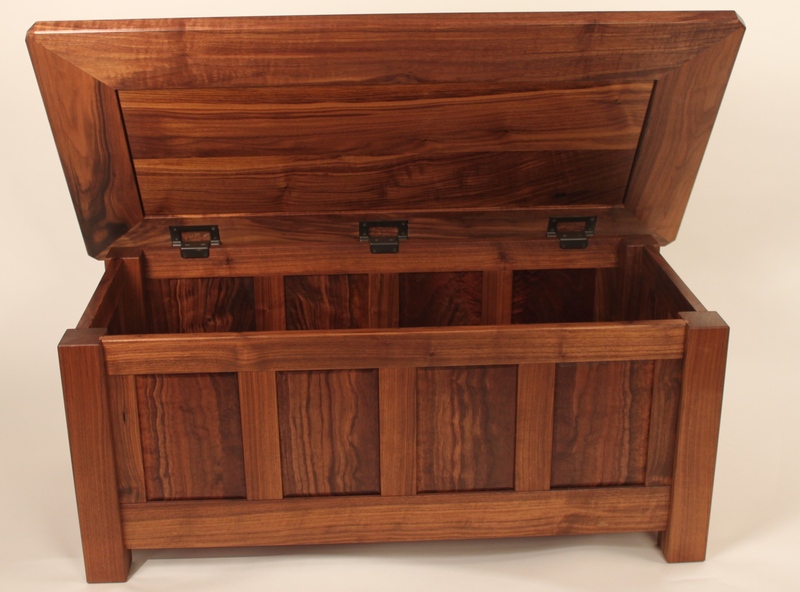 Version two was built with Oregon white oak from the Hackleman grove in Albany. High-school aged kids assisted with the milling. The interior cabinet will be made with the same oak, and may be “tarrified” by use of the shou-sugi-ban technique, or I may just darken it with vinegar and steel wool. I have been modifying the first design to get more of the iconic arches seen in the design of the actual bridge, as well as bring down the overall size. The feedback that I got at showing v.1 at the Studio was that I might try to slim-down some key features, advice which I took to heart while designing v.2. 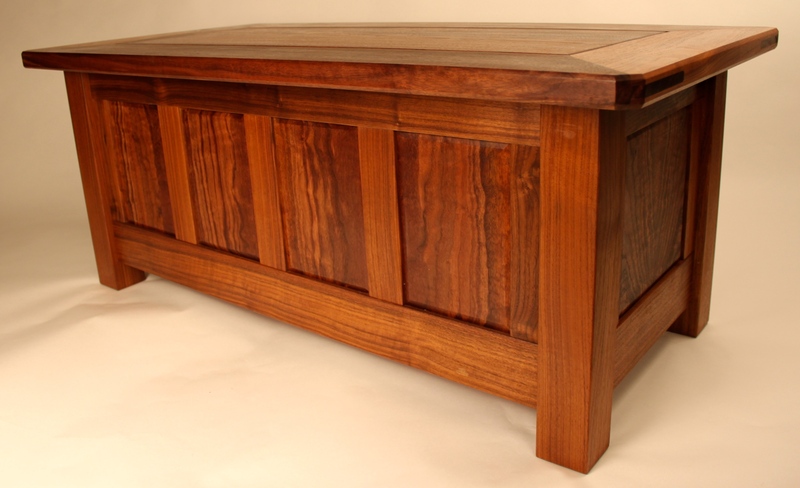 It is a challenging piece to build; full of curves and irregular-angled joinery, and the carcase is amenable to none of the regular shortcuts. The lumber itself, though beautifully colored, is very difficult to work with due to it’s propensity to never stay static. All in all a very satisfying fill-in project for this summer. You know what it needs? A bike rack! More details on the auction to follow. Bought non-woodworking tools that is. A Lowell three-light kit; One TOTA and two OMNI lights with umbrellas, stands, cords and a bag. A combo0diffuser/reflector with stand and a 9′ roll of backdrop paper with two stands and a collapsable pole for holding it. $500 worth of equipment, new and used. Waiting on a replacement for our camera charger and I’ll be ready to get some decent quality photos of my work. Once I learn to use the camera that is. Camera angle, lighting, composition, f-stop, aperture, focus, depth-of-field, white balance; these words are my new roadmap. I should have done this a long time ago. 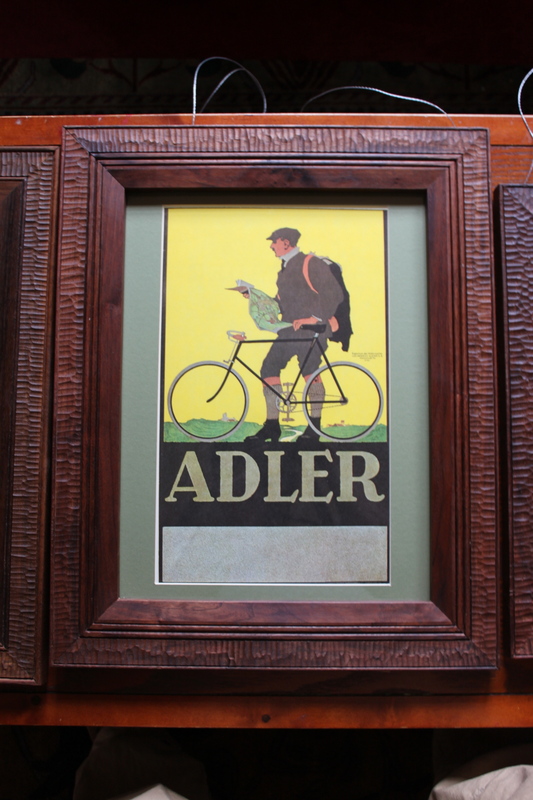 I just completed a run of hand-carved walnut picture frames for a series of bicycle advertisement re-prints I’d been collecting. They combine two of my passions- cycling and woodworking. I have many more of these prints available, and will be framing them bit-by-bit as I get the time and materials. 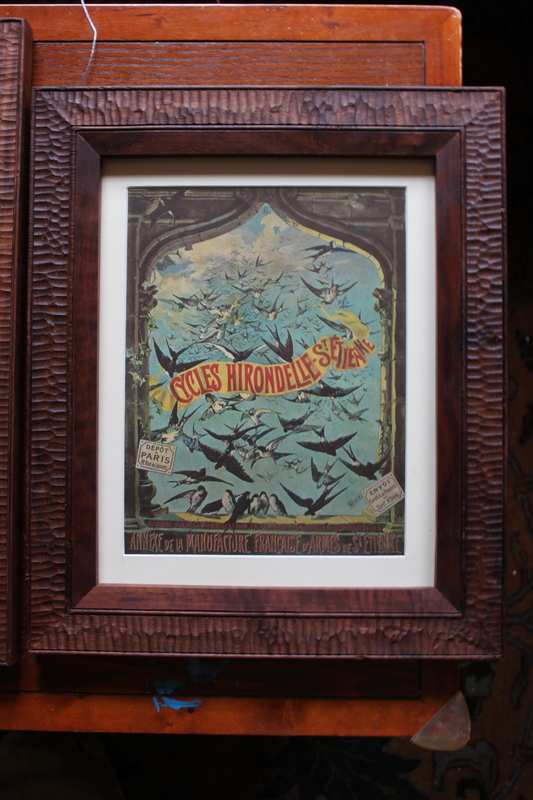 They are for sale for $175 each, and vary a bit in size but average about 16″ x 20″. 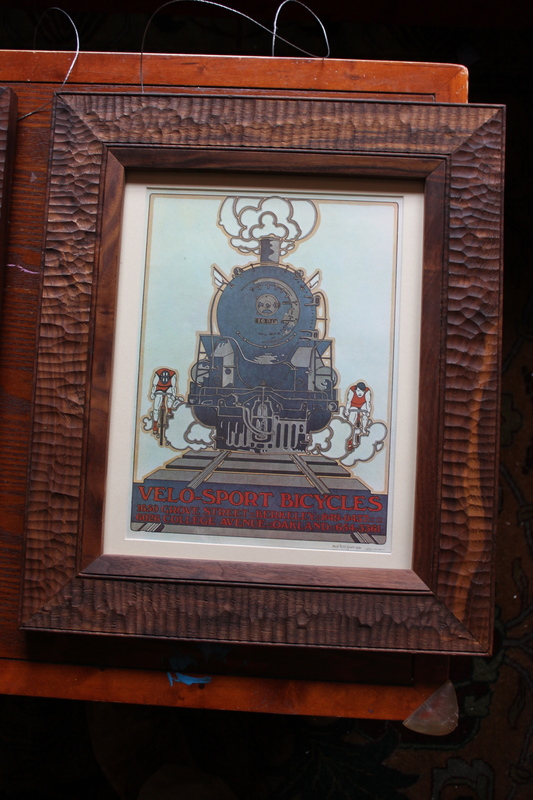 The frames are Oregon black walnut and were joined with a half-lap miter (which is much stronger than a typical picture-frame miter joint) and hand-carved and scratch-beaded in various configurations. 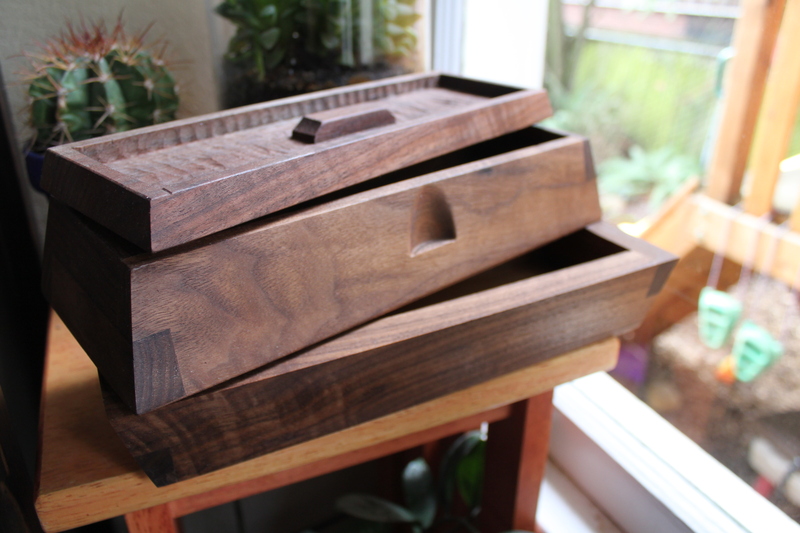 Another run of boxes finished and photographed. If your interested in one, let me know here. Prices specified do not include shipping. 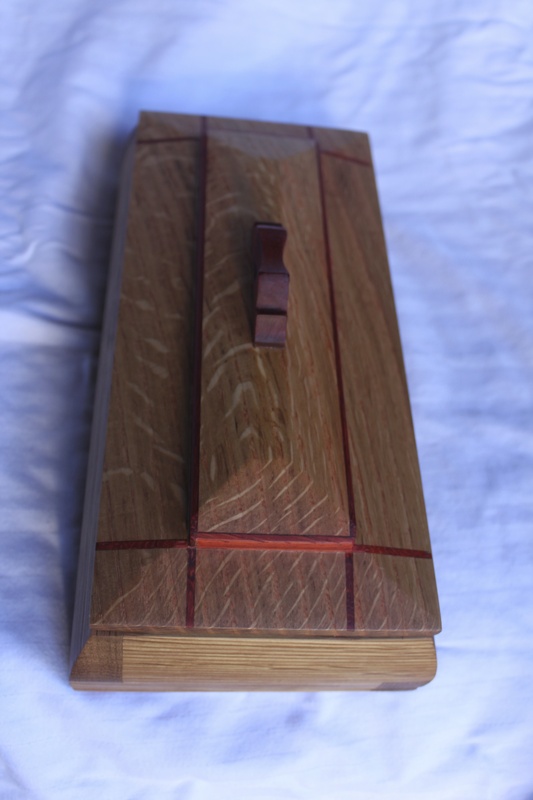 Our first project for the Mastery Program at the Northwest Woodworking Studio is a sushi box based upon a design Gary Rogowski published in Fine Woodworking magazine. 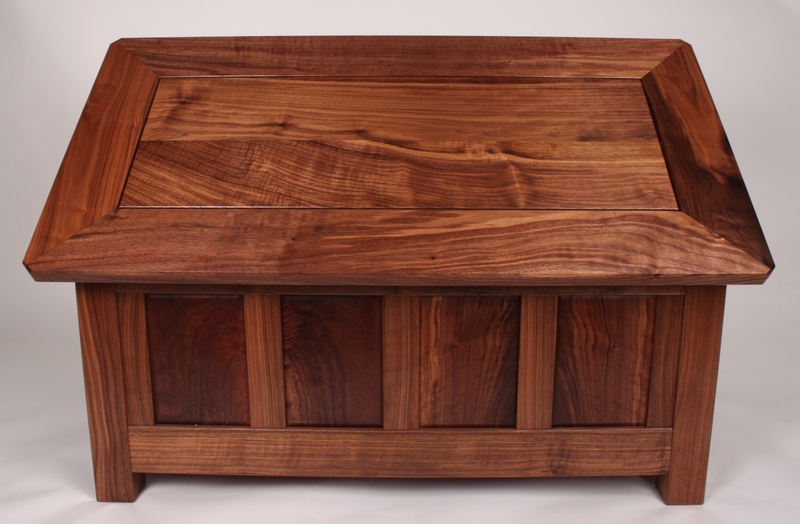 With my usual abundance of enthusiasm, I jumped right in with six original designs attempting to nail the perfect form, wood selection and pull. These are my first attempts. They are all for sale – if you are interested please let me know and I’ll set your choice aside for you. Otherwise, they are destined for a local gallery here in Portland and they price will reflect the markup. I think I need some better photography equipment; perhaps the sale of these will help finance a proper set of photography lights with reflectors and a professional backdrop. 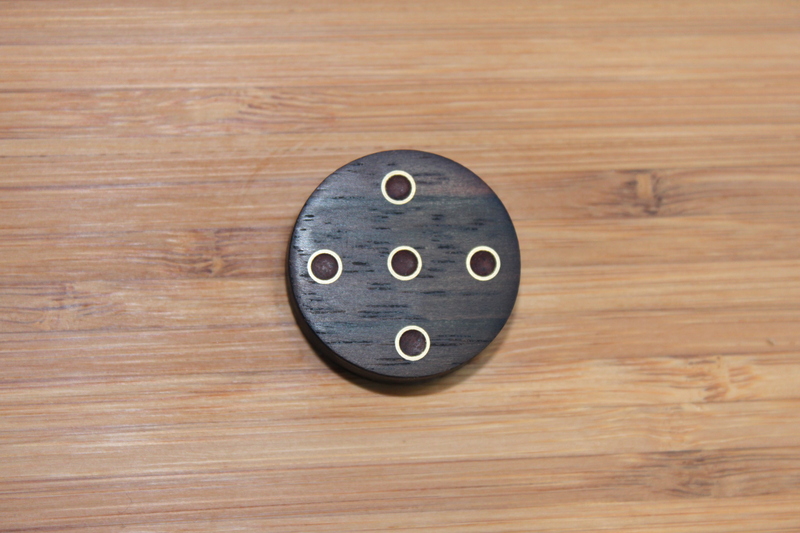 Bamboo box pull- rosewood, brass and paduk.